Without a World Cup, we didn’t quite get the joy of watching the best players in the world go around into the month of December, but the internationals we did get post-season matched the first 25 weeks and finals series before it – competitive, high-quality rugby league from start to finish. While the media went into a tailspin over a penalty crackdown and bad stories, unfortunately, found their way to the surface, it wasn’t what 2018 should be remembered for though as the Sydney Roosters took out the premiership. Let’s look back at the year that was. While the season finished with the Sydney Roosters winning the premiership for the second time this decade, it was the closest season in history which will be remembered fondly by fans. By the time Sunday afternoon of Round 25 rolled around, the eight teams who were going to play finals footy had been locked in, but their order sure hadn’t. In the final game, it came down to a matter of for and against for the elimination finals. In the end, the Broncos beat the living daylights out of the Manly Sea Eagles to host the St George Illawarra Dragons, leaving the Penrith Panthers and New Zealand to fight out the other elimination final. The qualifying finals would see minor premiers the Sydney Roosters take on the Cronulla Sharks, and the Melbourne Storm host the South Sydney Rabbitohs. The entire top eight was separated by just two competition points though, making it the closest in history. The top four were all on 34, and the bottom half of the eight on 32. Earlier in the season, it was all the Dragons. They started 2018 in much the same way they started 2017, but after a victory on Anzac Day against the Roosters and not having a swathe of injuries to deal with, they had fans believing. The famous Red V would suffer another dramatic fall from grace though, only just scraping into the finals in the end as the Sydney Roosters emerged from the rubble, winning a stack of games through the second half of the season to finish top. The South Sydney Rabbitohs also had a fire in the belly, at one point winning nine straight games. Both of those sides hit some stumbling blocks at the end of the season though, and coming into the finals, there were few teams being written off from winning the competition, such was the nature of a season where consistency simply wasn’t a word to be talked about. The first week of finals action was outstanding. Melbourne would get the better of the Rabbitohs in the first game by just a single point – potentially the game of the season – while the Roosters beat a bruised and battered Sharks in the other qualifying finals. The real interest in Week 1 was around the elimination finals though. The Panthers managed to beat a pretty ordinary Warriors who lost Shaun Johnson early doors, before the Dragons, who were written off by everyone, came out and thumped the Broncos. The Dragons win didn’t come without it’s issues though, as Gareth Widdop and Jack de Belin both copped injuries. Written off again in a derby against the Rabbitohs during Week 2, they pushed the game all the way to the bring before three Adam Reynolds field goals sank the Red V.
On the other side of town, the Sharks held on grimly to beat the Panthers by a point, but were no match for the Storm when they travelled to Melbourne the following week. The Rabbitohs, who were obviously tired, were no match for the Roosters either, setting up a Cooper Cronk grand final against his old teammates. The only problem with that? Cronk’s shoulder. He injured it badly against the Bunnies, later found to be a broken scapula, while Billy Slater was also cleared to play despite a shoulder charge and judiciary hearing which he fought and won. Cronk would then play with a broken scapula and the rest, as they say, is history. The Roosters belted the Storm from the opening minute as their forwards won the battle of the middle third, while the Storm simply didn’t look to be in the contest. The bravery of Cronk was one thing, but the Roosters were the best team on the day, and in a season where there was no clear favourite for the most part, it was always going to be the way – the best team on the day, taking the trophy. Coming into this year, the Queensland Maroons had won 11 of the last 12 series. 2018 was a changing of the guard though, with the super team who had been as close to unbeatable as you could get over the last decade finally breaking up. Cooper Cronk and Johnathan Thurston had retired from representative footy – that much we knew well before the series started. Even then, things hung in the balance, but when Cameron Smith pulled the pin in a shock announcement just weeks before the start of the series, it was clear things began to tip into the favour of New South Wales. A new-look Blues team helped matters, with debutants everywhere. New coach Brad Fittler had rubber-stamped his authority on the side, and it showed during Game 1 as the Blues played up-tempo, fast-paced and ran away with a 22-12 victory. Queensland weren’t helped by the injury to Billy Slater, but they were their own worst enemy with mistakes and errors, as the Blues scored twice down the stretch through Tom Trbojevic and Josh Addo-Carr in front of nearly 90,000 fans at the Melbourne Cricket Ground. Back in Sydney for Game 2, it looked like the Maroons had re-found their dominating mojo during the early exchanges. The Blues were sloppy, and it told on the scoreboard with Slater back in action as Queensland scored the opening two tries through Valentine Holmes and Dane Gagai. There wasn’t much to cheer about over the final hour of the game for Queensland though as Boyd Cordner’s penalty try in the 31st minute fipped the momentum of the contest after an Addo-Carr try six minutes earlier. When Latrell Mitchell scored, Blues fans dared to dream and while a Will Chambers try and James Roberts sin bin kept things interesting, the Blues held on for an 18-14 victory to regain the shield. While the Maroons won the dead rubber and Billy Slater controversially took out the gong for player of the series, none of it mattered as the Blues lifted the shield for just the second time this decade. Just like Origin, it was a new-look Australian side which took on some end-of-year Test matches against New Zealand and Tonga. While it had nothing on the World Cup in terms of total matches played and hype, the games were still quality, and the support of Tonga as they packed out Mt Smart Stadium in a sea of red, was something to behold. The Kangaroos weren’t the best of the teams either, losing to New Zealand in the first Test across the ditch. The Kiwis played a quality game of rugby league, and while Australia bounced back to beat Tonga, there has been a changing of the guard for the Kangaroos and it could be an up and down few years ahead. Simply put, they are no longer leaps and bounds ahead of everyone, as they were at the 2017 World Cup and for much of the last decade. Elsewhere, there was a stack of international rugby league, highlighted by Jamaica qualifying for the 2021 World Cup in England. Much of the focus on this year’s Super League season, from overseas at least, turned attention to Division 2 and the plight of the Toronto Wolfpack. The expansion club from Canada, who had promoted the season before from Division 3 to Division 2, were able to build a strong roster and fly through the season, only losing one and drawing two of their 23 games. They were seemingly head and shoulders above of the pack, but couldn’t get the job done in the promotion game against the London Broncos, who beat them 4-2 in a dour affair. Back up in the top flight, it was former NRL star Ben Barba and St. Helens who dominated the regular season. Barba was named the best player in the competition at the end of the season, having scored 28 tries, but that counted for little once the finals rolled around. The Saints were rolled by the Warrington Wolves 18-13 in the semi-final, while eventual champions the Wigan Warriors dominated the Castleford Tigers 14-0. The Wolves were no match for the Warriors in the decider, with the final scoreline reading 12-4 as Dominic Manfredi scored a double and Stefan Ratchford picked up man of the match. 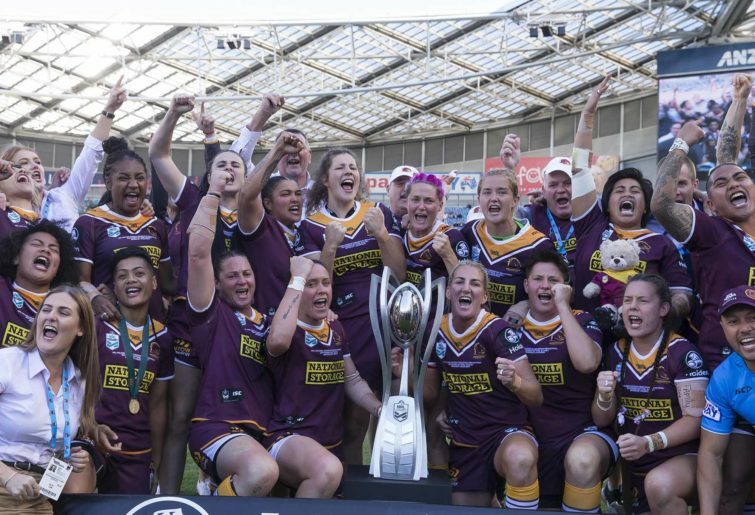 2018 was a monumental year for women’s rugby league, with the introduction of a nrl women’s competition and the women’s State of Origin officially being played for the first time, replacing the old interstate challenge. While there was no World Cup this year, the Jillaroos also had plenty going on with a couple of end-of-year Tests and more contracted players ahead of the NRLW. The NRLW saw four teams – the St George Illawarra Dragons, Brisbane Broncos, New Zealand Warriors and Sydney Roosters battle it out for the right to be crowned champions. While the reduced format with only four teams drew some criticism from fans, particularly when the Cronulla Sharks missed out on a foundation team, the format was a winner. It ensured the talent wasn’t spread too thinly across the clubs, although it would have been good to see more footy for the women. What we did have though was high-quality, with each team mixing it with the others. The Brisbane Broncos though, with a mountain of representative experience, were always going to be tough to beat, and so it proved as they took out the minor premiership and then smoked the Sydney Roosters 34-12 in the decider. Expansion looks like it might be coming in 2020 for the competition – or at least, it should be – with one more year of the same format first. There is a lot to like about the way the NRL are running the competition though, and their grand final on the biggest day of the rugby league calendar is a big tick. The Origin match was also high quality. Played in front of a big crowd at North Sydney Oval, the Blues came away with a six-point win over the Maroons, but the stand-alone event and crowd proves there is an appetite for the women’s game, which is good to see.